The Iridescent Flint Beetle (コガネモチ?, lit. : "Small Riches Holder") is an enemy in all three Pikmin games. Attack one by throwing a Pikmin on top of it, at which it glows red while overturning and drops a useful object; Pikmin attacking from on the ground cannot harm it. This creature disappears after a certain amount of time has passed or it has been overturned enough times. ↑ The game files specify that this enemy has 1 HP. After that, more hits will not generate anything. This is difficult to achieve before it returns underground, however, due to its unpredictable and swift movement. It also poses an indirect threat to Pikmin, as it will often run through Olimar's army. This results in the Pikmin automatically attacking and chasing it unless called back, which can lead them into danger. The creature on the Piklopedia. In Pikmin 2, its appearance was slightly changed. Pikmin no longer attack Iridescent Flint Beetles automatically as they do in the original game. In all Pikmin 2 Challenge Mode levels they're in, these creatures drop treasures. They are found in similar locations, but only drop three things: a 1-pellet (a dose of nectar if it's underground), 2 doses of nectar, and then a dose of ultra-spicy spray (3 doses of nectar if the ultra-spicy spray hasn't been discovered yet). Using Purple Pikmin, it is easier to fight them due to the shockwaves that the heavy Purple Pikmin produce when thrown. As a side note, it is possible to defeat these creatures while petrified, but they drop neither nectar nor spray and leave no corpse. On the main menu, if the player presses / , an Iridescent Flint Beetle may appear that can be controlled with / . The beetle will be swarmed if it gets close to the Pikmin. This is just one of the main menu easter eggs. The Iridescent Flint Beetle near the landing site in the Garden of Hope. In Pikmin 3, this creature's appearance is greatly altered. Its eyes are still on stalks, but it sports two horizontally-facing antennae that look almost like a mustache, its shiny exoskeleton seems to have layers and appears less vibrant, and its underside appears to have four glowing, blue spots. 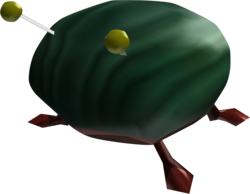 The only way to harm one of these creatures, as with previous games, is by throwing Pikmin on its back, upon which it drops nectar or pellets. The Flint Beetle is harmless and will remain underground until a leader or Pikmin approaches its resting spot. Once active, the Flint Beetle will scurry about in no particular direction; only away from the player after being hit. It moves quickly and can be difficult to hit at times, but repeatedly flipping it over for up to three times will provide increasingly valuable rewards. After being hit three times, or being active for a certain amount of time, the creature will scurry back underground. Though it does not die, it will not return for the rest of the day/challenge. While the Flint Beetle cannot be killed, it can have certain items knocked out of it. The creature can only be attacked with Pikmin, as leaders have no way of damaging this creature aside from ultra-bitter spray. Pikmin must be thrown at the Beetle's shell to flip it, knocking out useful items. The Iridescent Glint Beetle and the Doodlebug are damaged in the same way. Purple Pikmin in Pikmin 2 can home in, making them easier to hit with. With proper timing, or by repeatedly throwing Pikmin, one can hit the beetle before it begins running again, resulting in the creature staying in the same place. 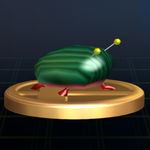 The Iridescent Flint Beetle appears in Super Smash Bros. Brawl and Super Smash Bros. for Wii U as a trophy. “A member of the flint beetle family featuring an iridescent, shining shell that is also prized for its strength. These beetles are packed with nectar and pellets, which they drop when attacked. These can be collected, although the reason for doing so is unknown. Apparently, Pikmin are quite attracted to these beetles—the sight of one will send them running after it. “These guys appear in the Pikmin series, dropping rare items and fleeing nearby Pikmin. Purple Pikmin can flip them over, making the whole "getting rare items" process a lot easier. According to Louie, cooking one of these guys yields a meal with a distinct and delicious flavor. “These rare bugs from the Pikmin series have a unique and delicious flavour. (That's what Louie says, anyway.) They also hold on to some valuable items, which might explain why they run away as soon as you find them. To make things easier, throw a Purple Pikmin at one to flip it onto its back, then send the rest of your squad to attack. The word "iridescent" in the Iridescent Flint Beetle's name means "shiny", referring to its shiny carapace. Flint is a type of rock, and this beetle was named after it. Its Japanese name is コガネモチ?. コガネ? means "Small amount of money", likely referring to how it gives out worse prizes than its golden counterpart, and モチ? means "holder". "Koganemushi" 黄金虫? also means scarab beetle, which its color is similar to. In its scientific name, Pilli envelopens, Pilli is close to the Latin word pili, which means "pikes". This word was possibly chosen because primitive pikes were made using flint stones. Envelopens is based on the English word "envelop", which means "to cover", possibly chosen due to the creature being mostly covered in a flint-hard shell. Its internal name in all of the games is kogane, the first word of its Japanese name. Portuguese (NoE) Besouro Iridescente Iridescent Beetle Name taken from the Super Smash Bros. for Wii U trophy. Close-up of an Iridescent Flint Beetle in Pikmin 2. A better look at the Iridescent Flint Beetle in Pikmin 3. A detailed side view of the Flint Beetle from Pikmin 3. The Iridescent Flint Beetle in an earlier version of Pikmin 3. Art of the Pikmin 3 Iridescent Flint Beetle from the Official Nintendo Magazine. There are two enemies in the Pikmin games similar to the Iridescent Flint Beetle. All are in different families while their genera are the same. In real life, however, it is impossible for members of different families to share a genus. The European version of the Super Smash Bros. for Wii U trophy advises players to flip the creature over with a Purple Pikmin and then having them attack it. This strategy doesn't make much sense, and was likely mistaken for the Anode Beetle instead, which lacks a trophy. 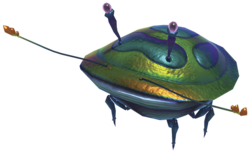 In Pikmin 3, the Iridescent Flint Beetle has 6 legs, making it the first anatomically-correct insectoid in the Pikmin franchise. In the Japanese version of Pikmin 2, the Iridescent Flint Beetle and the Doodlebug share the same family. However, in the English version, they differ between "Flint beetle" and "Flint bug" respectively. In the Spanish version, the Flint Beetle, Glint Beetle, and Doodlebug are from the same family. In Pikmin 3, when an Iridescent Flint Beetle is hit with a Pikmin and lands on the ground, it makes a clink like a coin hitting the ground. The Iridescent Flint Beetle may be based off jewel beetles. This page was last edited on March 2, 2019, at 19:51.